Snooper MY-SPEED AURA GPS speed camera detector provides alerts to both fixed and mobile speed camera locations such as Gatso, Truvelo and SPECS cameras via its internal database. It also cleverly let's you know what speed you are travelling and the speed limit for the road you are on! Speed cameras and road speed limits across the UK and Western Europe are covered and even better buy the Snooper MY-SPEED AURA from ActiveGPS and receive FREE lifetime speed camera updates - worth £29.99 a year! Speed limit database £10.00 per update/year. Snooper MY-SPEED AURA has been discontinued. To view the full range of 2018 speed camera detectors click here. Snooper MY-SPEED AURA is more than just a speed camera detector, yes it will alert to fixed and mobile speed trap locations, but it also provides speed limits for every road across the UK and Western Europe! All alerts are given both audibly and via the 1.77-inch TFT LCD colour display so you always know what lies in the road ahead. The Snooper MY-SPEED AURA uses GPS technology and two internal databases, the first is the Aura speed camera database for speed camera and accident blackspot locations and the second is a NAVTEQ database which contains all the road speed limit data. Also available to buy the Snooper MY-SPEED, this alternate product provides speed limit data only and has no speed camera information. When approaching a speed camera location, the MY-SPEED AURA provides alerts to both fixed and mobile speed camera locations via the Snooper AURA database. 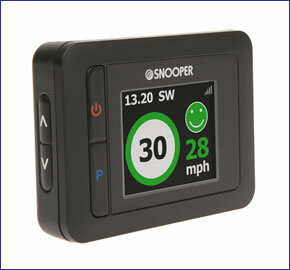 Snooper constantly update this database, you must register your device and download the database before first use and we suggest that you subsequently update at least once a week to ensure you are drving with the latest speed camera database. When driving on any road in the UK or Western Europe (whether a camera is present or not) the Snooper MY-SPEED AURA let's you know the road speed limit. The LCD screen displays the road speed limit and also your vehicles own speed in either MPH or KPH. The screen colour also changes red or green depending if you are above or below the posted speed limit, as an added attention grabbing measure! The Snooper MY-SPEED AURA, like all Snooper speed camera detectors, gets it speed camera data from the Snooper AURA speed camera database. The database provides advanced warnings to both fixed and mobile speed camera locations across the UK, Europe and in a growing number of other countries across the World. The database is constantly updated with the latest locations. Click here to read more about the AURA speed trap database. Do you have a question about the Snooper MY-SPEED AURA that's not been answered on this webpage? Please see our speed camera detector FAQs for questions from other customers and visitors. Plus if the answer to your question isn't featured, use the online form to ask us for the answer. Alternatively please telephone 01733 777623 Monday to Friday (9:30am-5:00pm) to speak to one of our sales team. Snooper MY-SPEED AURA is a plug and play device and as such can be set up in a matter of minutes. Inside the box you with find windscreen mounting bracket, this is designed to attach to the inside of your windscreen. A separate cigarette lighter car charger provides power to the MY-SPEED AURA and your ready to go. Snooper MY-SPEED AURA provides advanced warnings for all fixed and mobile speed cameras locations via the AURA database. The database normally costs either £2.99 a month, £7.99 a quarter or £29.99 as a limited special offer if you buy the Snooper MY-SPEED AURA from ActiveGPS before you'll receive the AURA speed trap database FREE for the life of the product. It is fully legal to use a speed camera detector in the UK. However, before using the Snooper MY-SPEED AURA outside of the UK we STRONGLY RECOMMEND that you check to ensure that the use of a speed camera detector in other countries is also legal. The MY-SPEED AURA speed limit database is supplied by NAVTEQ and updated on a annual basis, and is available at £10.00 per update/year.